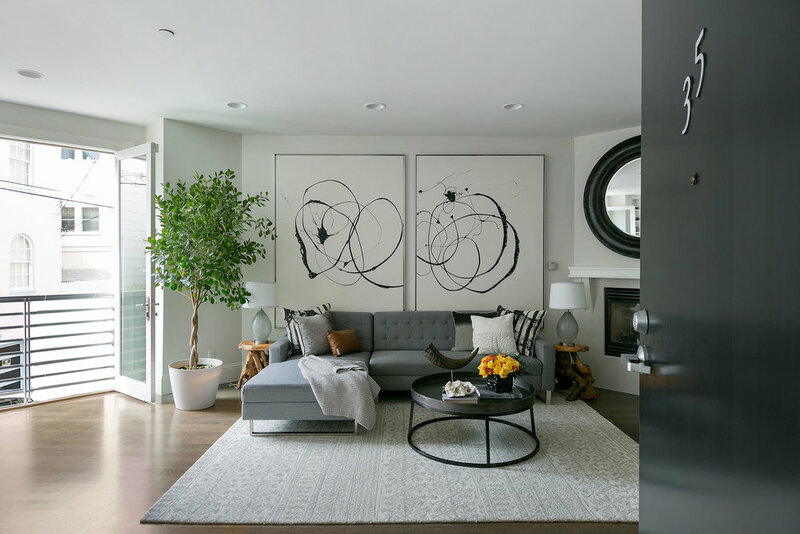 This three bedroom, two and one half bathroom Mission Dolores condominium offers the ideal balance of proximity to the best of the neighborhood’s offerings with the quaint beauty of Linda Street, which spans just two blocks tucked away in plain sight. Built in 2005, the building anticipates the needs of modern life with an open floorplan and high ceilings while channeling European style with sun-filled windows and Juliet balconies. The main living level enjoys natural flow between the kitchen, dining and living areas, centered around a gas fireplace. The kitchen has been recently updated with a DCS range and hood plus Miele dishwasher. Adjacent to the living area are two generous bedrooms (one en suite) with lovely double windows looking out onto the trees and succulents of the deeded back garden. Downstairs is the sophisticated master suite with spacious bathroom and private access to the serene garden. Don’t miss this stellar property, complete with in-unit laundry, independent garage parking, and prized location just half a block from the famed Tartine Bakery, one block from the Valencia corridor and three from Mission Dolores Park!